We know you are under stressed but don’t worry we have simple tips and tricks that help you to solve your paper in simple way. And you get admission in top medical colleges. 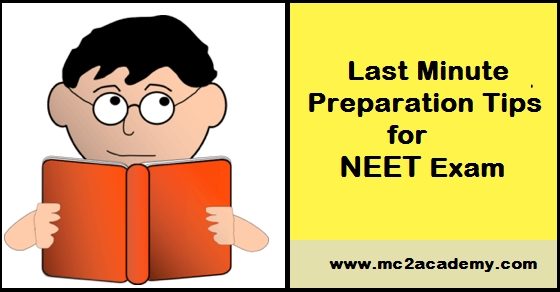 Here are some precise tips given by NEET classes in Pune for NEET students which helps to cover their all NEET Preparation in best way and feel relax & fresh in this time span to give their every possible efforts in Preparation. Practice Mock Test and Analyze Your Performance: Solve maximum mock test paper. After each Mock Test look your answer and analyze your performance. To check out in which topic you are weak or strong, how many marks you lost in negative marking system, your time management skill . It’s also give better idea about NEET 2018 Exam Pattern. More focus on weak point. Revision, Repeat and Practice: Focus on revising the notes that you have preferred for NEET Preparation. NEET questions are concept oriented which needs Revision with practicing. Try to perform revision with practice for that take out some important questions from Biology, Physics and Chemistry syllabus topics as per priority basis and solve them within time limit. Practice is useful to improve reading, understanding and question solving ability. Concentrate on Basic Concept Instead of Learning New Topics: Last day’s time used for remembering you basic concept, covering the points that you has already completed, instead of staring to learn new points. Focus on making your strengthen topics stronger. It’s help to find answer in less time span. Give Priority for Formulas, Diagrams, Charts and Graphs: Make a separate sheet of formulas, charts, graphs and diagrams from the syllabus of Biology, Physics and Chemistry on the first priority basis. It’s help to remind the concept in very less time at the day of exam. Stress Control and Health Care: When we realize that few days are remaining for Exam we feel pressure and tense. It’s very essential to take care of hearth and keep stress level in control to face exam in stable and fresh mood. It’s doesn’t matter how much your intelligent, how deeply you prepare for exam without a good health condition and mind relaxation. In this way if you follow all the tips then its beneficial for you. Best luck for your exam !! !